A clogged dryer vent can cause a fire. For your dryer to dry your clothes, it must blow out exhaust. Most dryers have a flexible hose that runs from the back of the dryer out through a hole in the side of the house. This hose can become full of lint that can eventually clog the exhaust hose if not cleaned out regularly. 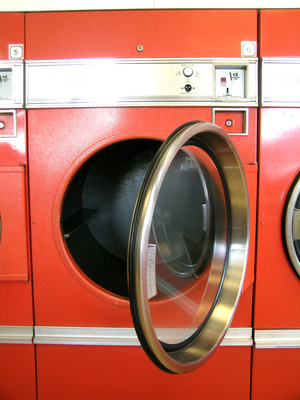 When lint clogs up the hose, your dryer will run less efficiently. This can cost more money in electricity because it will take longer than usual to dry your clothes. In some cases, a dryer vent hose with a lot of lint can also create a fire hazard. You can clean your dryer vent in a few easy steps, not only saving you money but reducing your risk of fire. Pull your dryer away from the wall so that you can get behind it. Unplug the dryer from the outlet. Unscrew the screws that connect the flexible hosing to the aluminum elbow using a screwdriver. You will find the aluminum elbow directly attached to the back of your dryer. Vacuum out both the aluminum elbow and the flexible hose, using the crevice tool attachment from your vacuum. Vacuum around the outside and the inside to remove as much of the lint as possible. Reconnect the aluminum elbow and the flexible hose after vacuuming. Make sure the screws are secure but not overtightened. Vacuum the floor behind the dryer to remove any lint that has fallen on the floor. Wipe the floor with a damp sponge to remove any residue. Slide the dryer back to position. Remove the outside dryer vent cover. Vacuum the inside and outside of the dryer vent cover. Vacuum the inside of the dryer hose that vents to the outside. Reattach the vent cover. Remember to clean the lint trap (usually located on the top of the dryer or inside the door) each time you run the dryer.